Here’s a photo interpretation puzzle for you. Last Saturday, I was hiking through the fresh snow in a small local prairie when I found this interesting print. An interesting print in fresh snow. Leadership Center Prairie – Aurora, Nebraska. Clearly the print was made by a bird, but what kind, and what was it doing? Judging by the size of the wing print, the bird was about the size of a robin. There were no other tracks or prints in the snow nearby, other than the small streak just to the left of the bird print. I think the print was made by a small raptor; probably a sharp-shinned hawk. My guess is that the hawk was swooping down after a sparrow, which was flying low to the ground. As the hawk neared the ground, the sparrow spotted it coming from its right, and was just able to evade the hawk – barely dragging its tail along the surface of the snow as it dodged away. Meanwhile, the hawk flared its wings to avoid hitting the ground, and flapped hard to regain the air – and both wings made slight contact with the snow as it did so. Its narrow tail also left a mark. The hawk’s feet scuffed the snow twice – once in the middle of the print, and again where the “head” of the print is as the bird lifted back into the air. Agree? Disagree? Ok, what’s your guess, and why? This entry was posted in Prairie Animals, Prairie Natural History, Prairie Photography and tagged bird, hawk, nature photo, photography, print, snow, sparrow, tracks, winter by Chris Helzer. Bookmark the permalink. That is so beautiful, like a bird making a “snow angel!” But your interpretation is probably much more accurate. You could be on C.S.I. I’ve never seen the full body print before — a hawk has taken some domestic ducks out of our pen and left wing prints, though. An excellent observatiion and what a beautiful print of nature in action. I agree with your assessment Chris. Other small raptors (kestrel, merlin) have stiffer wing feathers and I don’t think they would have left the same detail. Also, could the scenario be reversed? 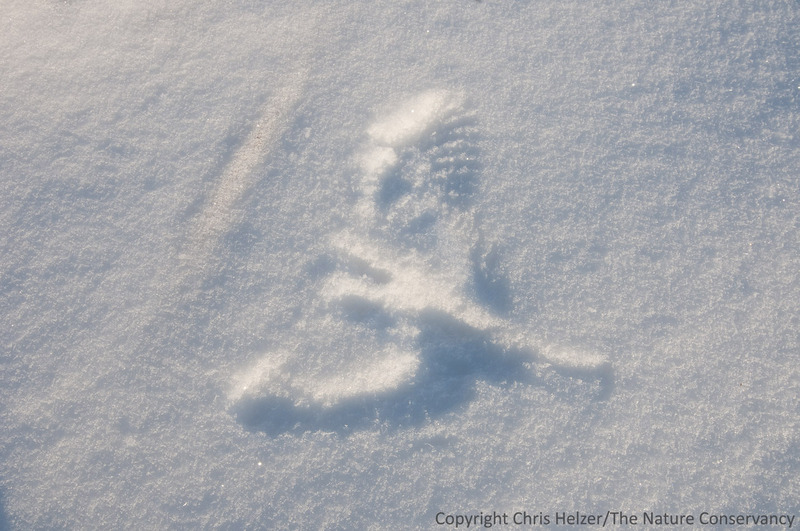 Could this be the imprint of the prey bird that dropped to the surface to avoid a larger raptor that was reluctant to hit the snow? Either way, it’s a great shot to capture on film. All of my previous observations of these snow patterns have been captures of small mammals by hawks or owls. I have no clue. I only know that you were very lucky to get to see it and we are lucky that you shared it with us! Thanks Chris! What a great print! Have to send this link to our local hawk watching folks. Robin sized accipiter certainly spells sharpy. Nice photo. I agree with your interpretation, assuming the scale of the marks match up with the size of a Sharpie’s feathers. Here’s a dramatic example of the same phenomenon that my sister-in-law captured on her camera this winter. Without observing any other comments, I naturally thought it was a bird. I rotated the image 180 degrees to correct my eye vision to light/shadow image. Kestral after a small prey? VERY few (no?) insects are active on snow, so it must be a mammal. Kestrals are small so it’s prey must be a mouse/mole. Lucky kestral; unlucky vole. Just now I’ve read all the comments. I think my guess wasn’t too bad. Your guess that suggests it was a sharp-shined after a low flying sparrow sound great. If only we were fortunate enough to view a video of that brief natural event. I just came across this post today. I agree with your assessment of the ID. To my eyes, the shape of the print is perfect for an accipiter such as a Sharp-shinned Hawk, probably a male in view of the size that you describe. The long, narrow tail and the short, rounded wings are perfect for an accipiter. I really appreciate the quality of the photos in your posts, as well as your keen observations and insightful comments.